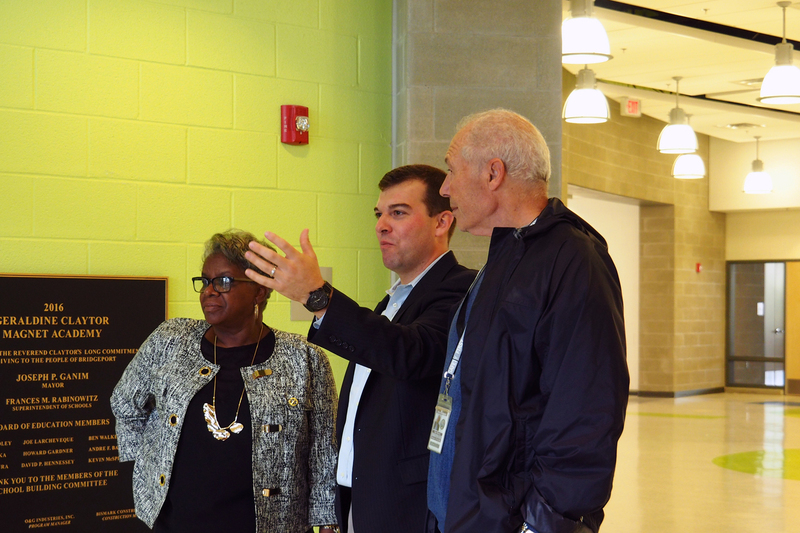 Rep. Steve Stafstrom got a preview of the new Geraldine Claytor Magnet Academy in Bridgeport, the new $51 million K-8 school that is scheduled to open in January. He was joined by Sen. Marilyn Moore, City Council member Scott Burns, and Bridgeport’s school construction coordinator Alan Wallack. The new school replaces the Longfellow School on Ocean Terrace and will focus on science, technology, engineering, art and mathematics, in addition to having modern science labs, and spaces for art and music rehearsals. Rep. Stafstrom along with other members of Bridgeport’s legislative delegation were instrumental in securing an additional $1.5 million in state funding to pay for school furnishings and related school improvements. Those who attended Longfellow will be given first preference. Those students have been learning at Columbus and Black Rock schools since Longfellow closed and was demolished, said Alan Wallack, Bridgeport’s school construction coordinator.